To be honest, there is way too much talent in this city to mention. 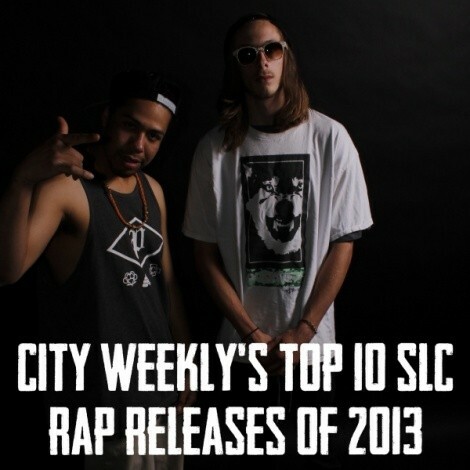 So, you should know that the purpose of this list is to recognize and shine light on the best hip-hop to come out of Utah over the past 12 months, not to hurt the feelings of sensitive rappers who are in the wrong spot, or who were left out entirely (but that will probably happen, anyway). Zigga's November 2012 mixtape Lake Bonneville was a huge effort, featuring Utah guest spots like Emerson Kennedy, B-Side and Dumb Luck. Now, in 2013, it appears the Salt Lake city emceee is carrying this momentum forward with a steady stream of quality singles -- "Out The Blue" featuring XXL Magazine's 2013 freshman of the year Dizzy Wright and "Gazebo," produced by Chemist of Elm Productions. Check out more from Zigga, here. Part of the always-creative Makemind camp, Morris Bars' 2013 release Bomb Voyage is a well-rounded journey through left-field underground rap. Two of my favorite local producers, Zerkseez The Invader and Piccolo, provide a smooth and mellow backdrop for Morris to blast off on the best of tangents. It's the type of deep, introspective hip-hop you'd expect from the kids who hang around with DopeThought. Check out his full mixtape here. When two respected names in the 801 rap scene get together, good things will happen. This mixtape is 100 percent, pure and classic boom-bap, laid out in the theme of a Prince Paul story album. The entire project uses samples from the 1991 musical The Five Heartbeats and the production feels smooth and nostalgic, in a good way -- like the type of rap that would feel at home in Babu's Duck Season series. The Five Heartbeats mixtape was a highly underrated, huge release from last April. Consisting of emcees Hurris and Gig and producer Mason Brewer, Better Taste Bureau have been responsible for a steady streak of high-quality releases and projects this past year. The free to download Better Taste EP is the first piece of work under their new moniker Better Taste Bureau (formerly Hurris & Gig) and the EP's lead single and video. "Lookin' Back," is just one example of what this up-and-coming rap group is capable of. I was first put on to Malevolent MC, aka Malev Da Shinobi, by KRCL's Friday Night Fallout host Planit, in his words, "He's reeeaaal nice." I've been jogging through Malev tracks on my iPod every since. Working mostly with producers outside the U.S., Malev's penchant for Golden Age-style production (like on "Fading Flaws") allows him to flow like a young Pete Rock. Over the past year, the baritone-voiced rapper has been putting out the occasional single at a steady rate of one a month or so. Check out the rest of his catalog here. Liberty Park emcee Emerson Kennedy is one of the most multidimensional rappers in Salt Lake City. He can harmonize, freestyle, write and, most importantly, piece together well-rounded releases like Denim. The overall quality of this album is on another level. This is in part due to local producer Brisk, (who lent a hand on a number of tracks) as well as few solid features from talented Utah artists like Concise Kilgore and Lefty 2 Guns. Rapper Marcus Agee and producer Milo Green are the West Valley duo New Truth. They're young, hungry and not afraid to stray away from anything remotely formulaic. Green's production has the ability to remain creative and simultaneously simple. It pairs perfectly with the Mississippi transplant Agee, who raps as if the process of making hip-hop is personally therapeutic. Truth Be Told dropped last June and I still find myself going back and listening to tracks like "bboyREM(ix)," "Anchor Down" and "Compose Your [Mindset]." Released in October, Dine and Dash is one of the most creative rap drops to come out of SLC. Stream-of-conscious rap is on full display, as emcees Shelby Washington and Harrison Montgomery rhyme like a pair of blunted kids in a basement. This 12-track EP is raw, gritty and meticulous at the same time. It's also probably the best collection of work from mastermind producer Andrew Auman, aka Piccolo. Atheist is one of those rappers I expect to someday leave SLC and join a crew like Anticon. He's professional, polite and one hell of a rapper. Atheist seamlessly blends comedy, nostalgia and high-quality rap on probably one of the most complete albums to come out of Utah in years. I wouldn't be at all surprised if Topanga makes everyone's top 10 this year, for all genres. Guest spots include DJ Scratch Mo, House of Lewis and legendary Crown City Rockers rapper Raashan Ahmad. Every week, for 13 weeks, Concise Kilgore released a single -- ultimately making up his insanely ambitious KilWave series. Though he also dropped the nice-and-wavy FiceLords Mixtape last summer (with DJ Flash and Flare), it's KilWave that truly displays the depths that Concise can go. Every track on KilWave is an exercise in Concice's ability and willingness to rap over just about anything. Guest spots include Planet Asia, Brisk and Yung Rip. Download the entire series for free, here.